New Balance’s marketing pitch: A sleek silhouette with an ultra lightweight and supportive ride. Upper: Engineered mesh, inner sleeve, fused synthetic. Midsole: Single density Fresh Foam midsole, 6 mm heel drop. Outsole: Hard carbon rubber under the heel, blown rubber under the mid and forefoot. Weight: 244 gms/ 8.6 Oz for a half pair of Men's US 9/UK 8.5/EUR 42.5/CM 27. 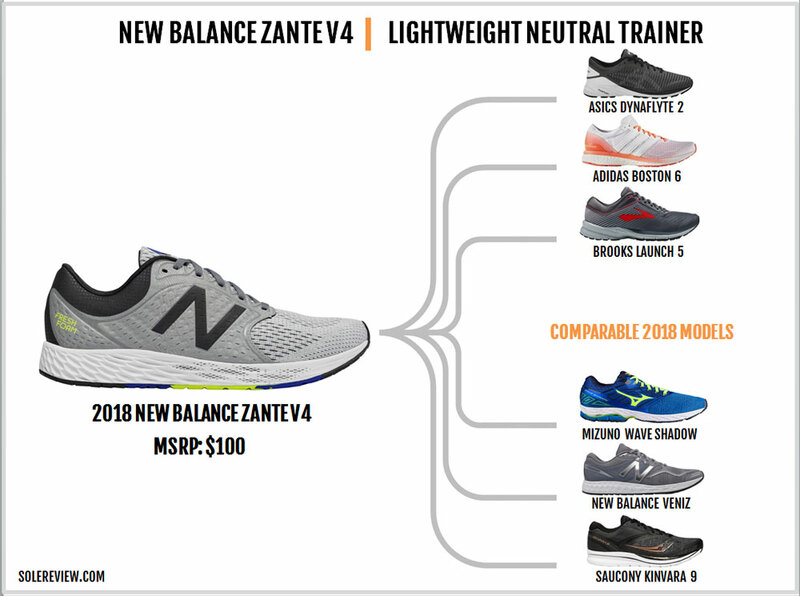 The Zante V4 is an affordable and versatile lightweight trainer. Updated for 2018 with a new upper and a slightly tweaked ride. Can we get the magical ride of the Zante V1 back please? The Fresh Foam Zante has held its own for the last four years, and with good reason. When the first Zante showed up in the cold winters of 2014, there weren’t many running shoes with the versatility of a daily trainer and a race day shoe. Sure, there was the adidas Boston, but then we’re talking $100 retail territory here. Lightweight, cushioned, and affordable, the Zante addressed a latent demand unmet by existing products. Not surprisingly, the Zante went on to become a best-seller and laid the foundation for what would be the start of a successful series. In the running shoe industry, it is nearly impossible to incorporate the market feedback of the first shoe into the next version. Given the long lead-times involved in introducing a running shoe to market, the annual shoe update process is fraught with uncertainty. So it’s been four long years since the Zante made its debut. How does the V4 stack up? On a conceptual level, not a lot has changed. The Zante V4 remains a lightweight, comfortable, and an affordable product which performs the duty of a daily trainer and a fast trainer with ease. The V4’s upper gets new clothes, a part of which is a new ‘Hyposkin’ midfoot panel which affects the fit character. Below the upper is a brand new midsole, insole, and outsole which gives the V4 an updated ride quality. New Balance never managed to get the original midsole recipe right in any of successive Zante versions. The same holds true for the Zante V4 as well. Thus, it’s fair that we compare the V4 to the outgoing V3 rather than the beloved V1. 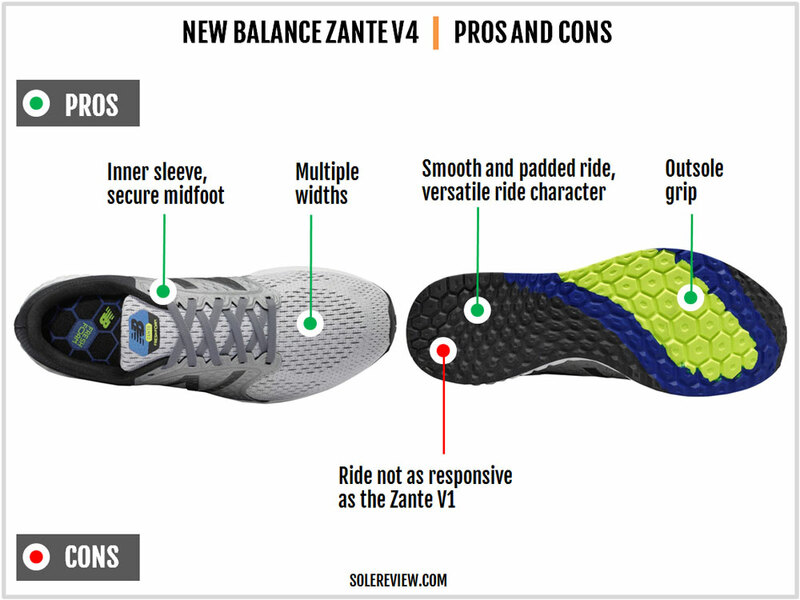 Before we proceed to a nuanced coverage of the ride and fit differences, we must point out that this review is for the regular Zante V4 version. There exists a second Zante V4 edition with larger mesh pores and less Hyposkin. This other Zante is a ‘summer-ready’ version if you will. When we reviewed the first Fresh Foam shoe ever – the 980 – we highlighted the role of the insole in the overall ride quality. The same goes for the Zante V4 too. 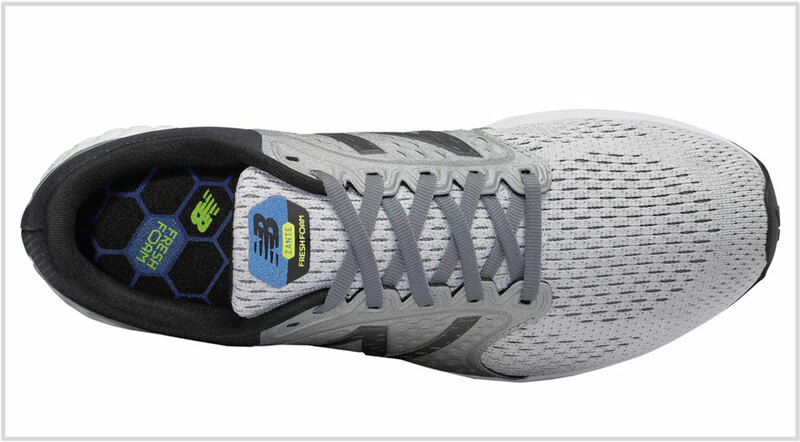 This is the third time that New Balance has updated the insole design, and it ends up influencing the ride. The Zante V1 had a perforated insole made of compression-molded EVA foam. The V3 had a similar formulation, but without the holes. The V4 replaces its in-house insole with a new Durapontex footbed supplied by a Taiwanese manufacturer. This isn’t the first time New Balance has used Durapontex; the Boracay has it too. On a related note, Skechers uses Durapontex insoles too – the 2018 GoRun Ride 7 has one. With this update, the Zante V4 has a softer top layer than the V3. The Durapontex insole has a smooth texture and is softer than the older type. Also, the ride quality will depend a lot on the running speed. At lower paces (say 10 min/mile or 6 min/km), the softer insole makes the Zante feel more cushioned than the V3. As one picks up the pace, the increase in superficial softness becomes less noticeable. It is easy to mistakenly conflate insole cushioning with midsole cushioning. There’s a good reason why we spent some time focusing on the insole change. Most of the ride difference between the V4 and V3 is on the account of the new insole. The V4 has a brand new midsole, but you know what they say – the more things change, the more they stay the same. 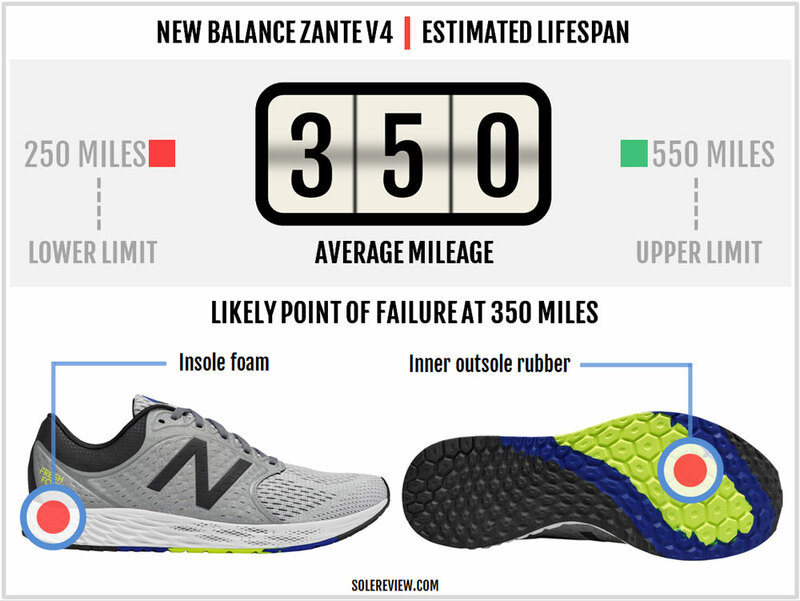 Like the V3, the 2018 Zante V4 uses a block of single-density ‘Fresh Foam.’ The latter happens to be an EVA (Ethylene Vinyl Acetate) foam variant which is used across New Balance’s running shoe line. And there’s nothing special about it. Fresh Foam, like most EVA foams, provides decent levels of underfoot padding. But apart from that, it’s just a regular foam. One of the reasons why the Zante V1 had a great ride is because it had a softer midsole. Later versions switched to a firmer midsole and the magic was lost. The same applies to the V4 too. 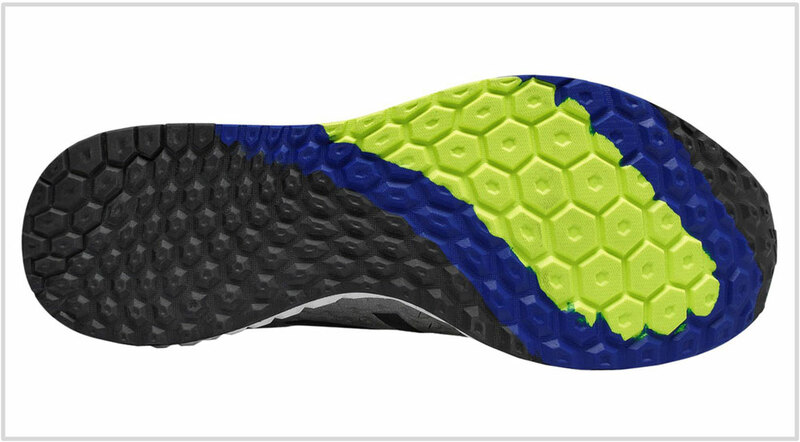 The foam density is similar to the V3 and so is the overall level of cushioning. There are a few design changes, but they do not have a significant impact on the V4’s ride. To begin with, the forefoot-midfoot sidewall now has laser-cut grooves instead of molded cavities. The 1080V8 uses a similar treatment, except that it is under the rearfoot. The laser-cut holes are smaller than the molded ridges of the V3. And given that both the V3 and V4 have a similar foam density, there is little difference in the ride character. The Zante V4 has a midsole with protruding (convex) molding details on the inside (medial) and an outer sidewall with depressed (concave) molding. In theory, this allows the outer midsole to compress easier than the inner side. And it does – just not to the extent when it comes a distraction. Hence, the Zante ends up delivering a neutral ride with very little bias, the concave grooves notwithstanding. With a strong neutral character, the Zante has a supportive ride. The Zante V4 is more supportive than the original Zante, since the part of the V1’s appeal was its softer midsole splaying under impact. The V4 scores great on the smoothness of transitions. The single-density construction adds consistency without bumps or sink-spots. This is what makes the Zante versatile. If you’re on a long and easy run (10 miles+, 11 min/mile), the padded midsole keeps you comfortable. 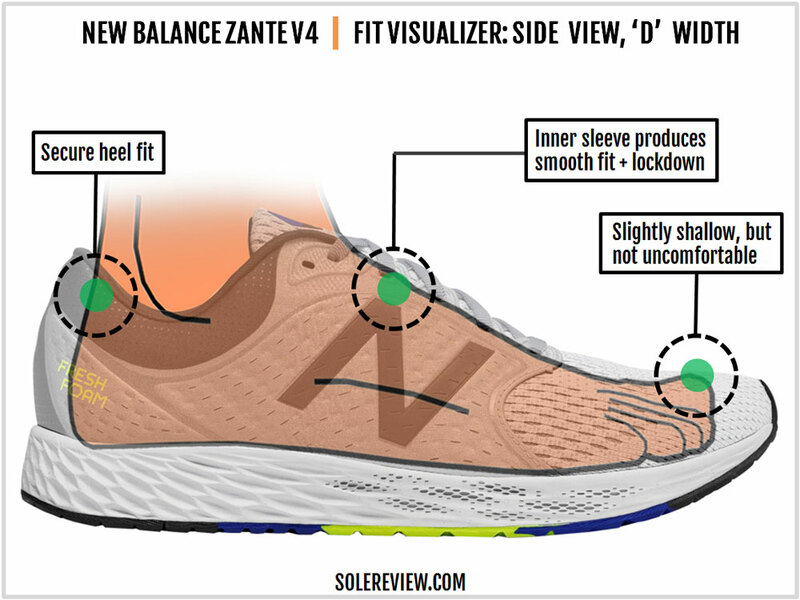 On the other hand, if you take the Zante V4 out on a medium-paced 10K run (around 7 min/mile or under 5 min/km), then the supportive midsole with a stiff forefoot is a good fit. The Zante’s lightweight 8.6-ounce weight turns out to be another positive for a distraction-free run. That said, for shorter races of below 10k, a shoe like the 1400V6 makes more sense. Please refer to our rotation section for recommendations. The outsole layout has not changed except for minor, superficial updates. The new lugs are more prominent than the last version, though it’s hard to tell the grip difference. Most of the outsole is blown rubber, and a harder crash pad is neatly integrated under the heel with a groove. This is the only point on the outsole which splays upon impact. All Zante versions have demonstrated good grip on road and track. The absence of flex grooves is what makes the forefoot slightly stiff; not a bad thing if speed is your friend. 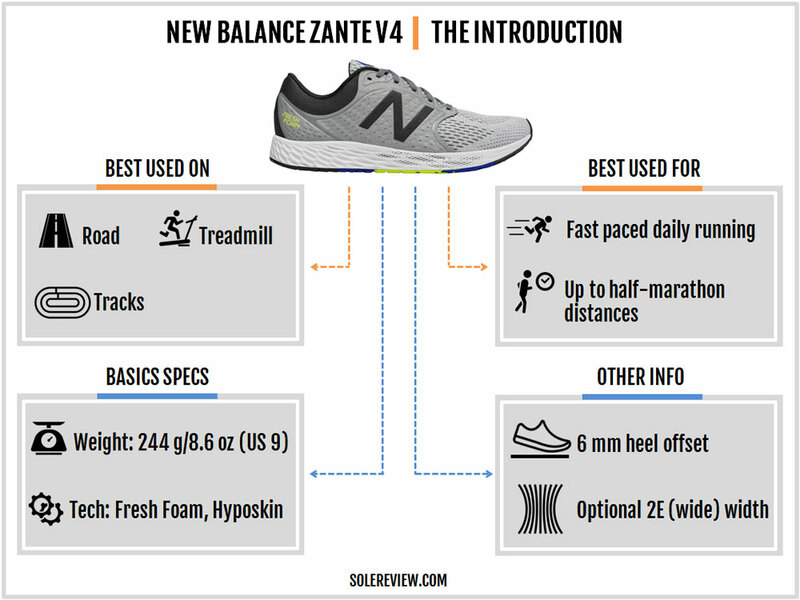 The Zante V4 continues to be a versatile shoe to run in, but one questions whether it could be better. A lot of water has flown under the bridge since the Zante V1, and there are many worthy competitors today. Skechers is doing a great job with their foam materials, and Nike could possibly release an entry-level fast trainer based on the React platform. New Balance needs to do better either with materials or price. 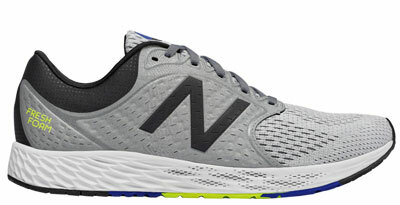 After all, Fresh Foam isn’t limited to specific price-bands but is saturated throughout the New Balance assortment. How about the Zante with a Revlite midsole? That should do the trick – for now. The Zante V4 has a slim upper profile, a part of which is a relatively pointed and shallow toe-box. That’s been true for all Zante versions to date, so this isn’t something new. Regardless of its slimness, the Zante’s streamlined fit is still more relaxed than a true racing flat. There’s no irritation or rub in the toe-box, just enough lock-down to enable runs of a fast nature. 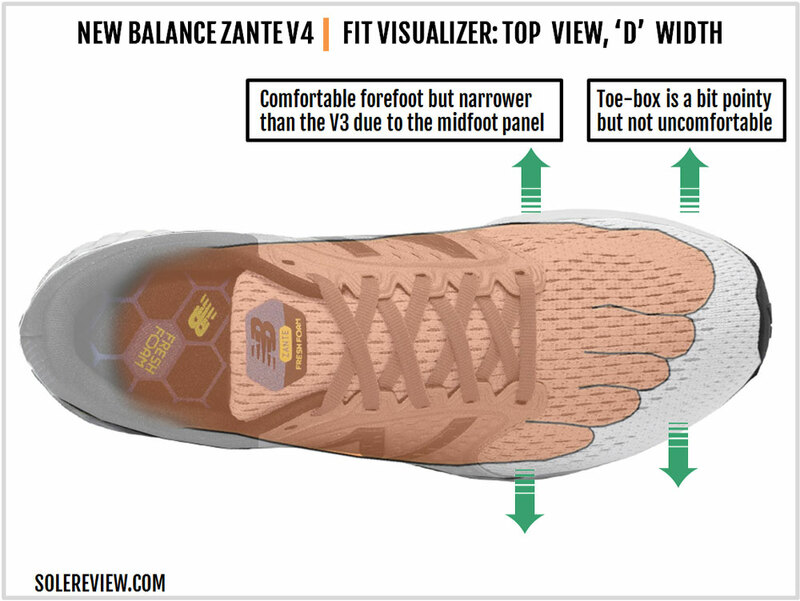 The V4 has a narrower forefoot than the V3 due to the new midfoot panel. The Hyposkin component moves closer to the front and hugs either side of the forefoot. So if you’re trading your Zante V3 for the V4, you’ll sense the snugger fit. At the same time, the V4 has lower top-down lacing pressure under the first lacing row. The V3’s first lacing row was independent of the midfoot panel (same as the V1) and applied pressure when laced tight. On the V4, all the eyelets are integrated into the panel (like the V2) which results in a uniform top-down pressure. The Hyposkin midfoot panel isn’t as stiff as it looks. The synthetic comes with small slits which give it pliability and ventilation. The new design also requires nearly no break-in compared to the V3’s upper which had a stiff last row of eyelet. Just in case the Hyposkin panel happens to be a deal-breaker for you, the Zante V4 is also available in a summer version with more mesh and less synthetic. An inner sleeve has been a part of the Zante ever since its introduction. The V4 has it too, and you get a smooth interior with a confidence-inspiring midfoot grip and no tongue slide. In the rear, the Zante doesn’t change much. The heel has a new lining and a collar design which is softer/smoother than the V3. The new stitch-and-turn design of the collar leads to better grip near the top. The Zante’s outsole rubber has proved to be durable over the years. Once past the initial wear stage, the outsole holds out for several hundred miles. Localized wear and tear happens near the heel and the outer forefoot transition zone. The Fresh Foam platform is fairly resistant to fatigue, though both the insole and the midsole will undergo a minor loss of cushioning over time. A lot of what made the Zante series so popular in the past stays with the V4. The inner sleeve equipped upper is secure and seamless. The business end of the upper has a snug fit for effective grip without any discomfort. The Zante’s midsole volume is right between a race day shoe and a regular trainer. This gives the shoe its versatility, with use-cases ranging from quick training runs to medium-paced half marathons. The full-coverage outsole grips well with a long useful life. The Zante is also excellent value for money, and the options of additional widths make the package sweeter. There are a few negatives. The V4 (and the V2 and V3) never regained the magical ride of the V1 which was better cushioned and more responsive. The V4 also has fewer reflective elements vs. the V3. The Zante is categorized as a lightweight trainer, positioned between cushier trainers and race day shoes. So rotating the Zante with shoes from the aforementioned categories makes sense. 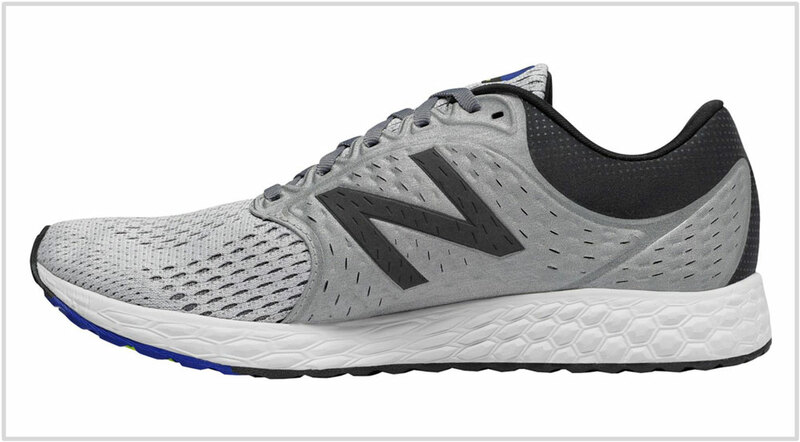 The New Balance 1080V8 is a bulked-up Fresh Foam shoe for those long runs of 15+ miles. If something light and speedy is your need, the 1400V6 is your go-to shoe. 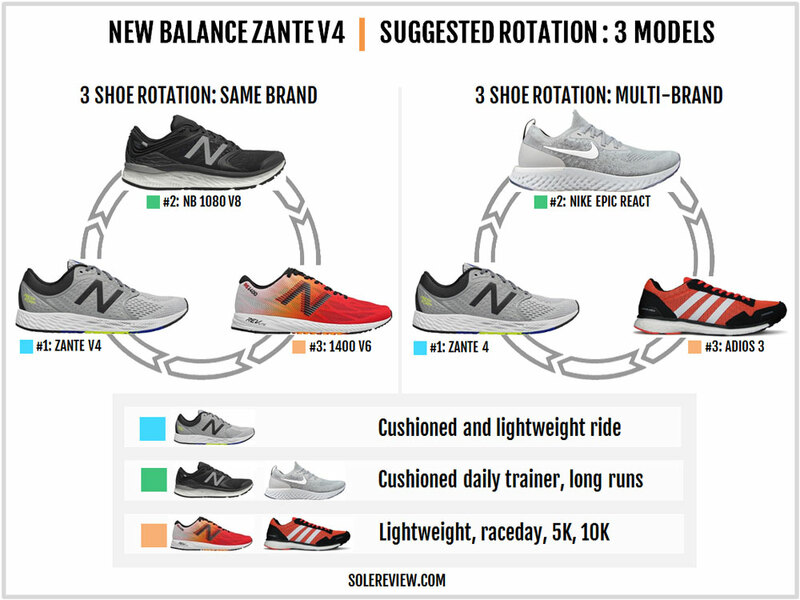 There are many cushioned options outside the New Balance universe. For example, the Nike Epic React Flyknit is a cushy and responsive trainer which makes short work of longer runs. And one can substitute the 1400V6 with the adidas adizero adios 3 for race day. This list of similar shoes is one of the reasons why the Zante sells well. There are very few running shoes which offer the functionality and comfort of the Zante at $100 retail. Sure, there are shoes in other brands with prices in double digits. But they either don’t compete with the Zante on a functional level, or have lower material specs. 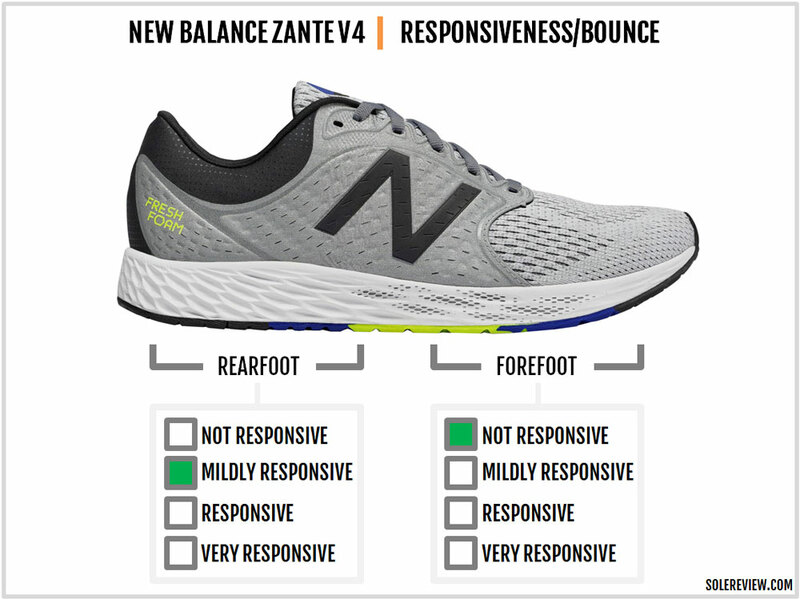 Interesting, the New Balance Fresh Foam Veniz is the Zante’s closest competitor. The Veniz is based on the original Zante V1, which means it’s Zante vs. Zante here. The Asics Dynaflyte 2 has a similar functionality as the Zante but with a higher price tag and a firmer ride. The adidas Boston 6 is a premium lightweight trainer with its characteristic Boost responsiveness and a truck of an outsole. If cushioned and lightweight is what you want, then the new Saucony Kinvara 9 is your ride. The Brooks Launch 5 competes on price but with a firmer ride and a higher heel offset. The Mizuno Wave Shadow is more race-oriented than the others here, if that’s what you’re looking for.